Large Format Porcelain Tiles - Florim Ceramiche S.p.A.
Magnum is our answer to the most advanced architectural and interior design needs. Brand new sizes – starting from 80×80 cm up to 160×320 cm – which combine light weight, versatility and technical and aesthetic performance that is the result of the most advanced production technologies. The Magnum maxi sheets revolutionize the concept of continuous surfaces and are designed for any type of application: floors and walls, rainscreen cladding, indoor and outdoor furnishing. A vast proposal of nine sizes with reduced 6 mm thickness and various material inspirations let you dress up spaces and furnishing with a total look that has an astonishing effect. The Magnum project – Honorable Mention of the 2016 ADI Compasso D’Oro – is available in the Group’s various brands (Floor Gres, Rex, Casa dolce casa – Casamood and Cerim). 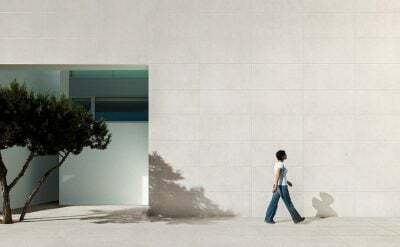 Lightweight, versatile and with an extremely high aesthetic impact, the Magnum porcelain stoneware maxi sheets open up new frontiers in designing integrated environments, ensuring maximum freedom of expression. Floors, bathroom tiles, kitchen tiles and more in general, all vertical surfaces can finally be coordinated. What is the end result? Total look environments with great personality characterized by absolute stylistic coherence. All of this, plus a guarantee of the highest technical and aesthetic performance that has always distinguished our products. Our Magnum Oversize large slabs expand their range. Two new formats and a new finish become available to offer more and more dedicated and smart solutions for different intended uses. 120x280cm – a size which meets the aesthetic requirements of who prefers a covering that reach the ceiling with the lowest waste possible, functional for the interior design. 60x240cm – it allows playing with volumes thanks to its modularity with the 120×240 size from which it derives (already available in the range). R10 class B + PTV > 36 surface for the 120x120cm and 120x240cm size – dedicated to commercial application and major works, which needs high technical performances. The large sizes and the technical performance of the Magnum maxi sheets are the ideal solution for the external cladding of buildings. A perfect mix of resistance, light weight (only 6 mm thick), functionality, easy to install and maintain, with an extremely high aesthetic and energy value that enhances the building industry, with the guarantee of the top notch performance that has always distinguished our products. The various brands that embrace the Magnum project (Floor Gres, Rex, Casa dolce casa – Casamood and Cerim), available in a wide variety of material inspirations, complete the result, meeting and granting the aesthetic desires of each designer. Our porcelain stoneware maxi sheets creatively dress up modern spaces and perfectly match new interpretations of traditional destinations for indoor and outdoor furnishing applications and elements. Low thickness (just 6 mm), an extremely flexible product with very high technical performance that makes it wear and water resistant, as well as long lasting make the Magnum surfaces an extremely versatile product, ideal for covering tables, counters, shower floors, doors, chimneys and other application solutions. In addition to all of this, there is an extraordinary variety of aesthetic inspirations that satisfy the various decorating styles in order to create a perfectly coordinated environment. Marble, wood, stone and cement finally become part of the interior design without any functional limits. 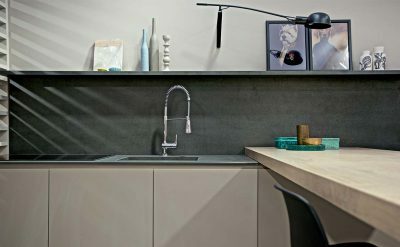 The best of the kitchen countertop and every one of its complements, finally customized in style and design, without compromise. 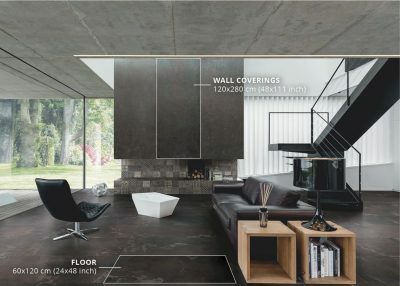 Porcelain stoneware sheets in a unique large size (greater than 160×320 cm) available in three thickness options (6, 12 and 20 mm) and various finishes are at the service of interior decorators to provide creative flexibility and high technical and aesthetic performance. Cutting and drilling large format tile: instructions and video tutorial.